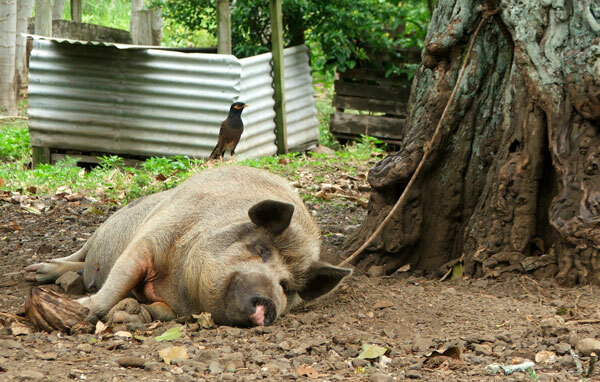 I first met Mrs Pig at dusk on Day One, snoozing underneath a huge tree. 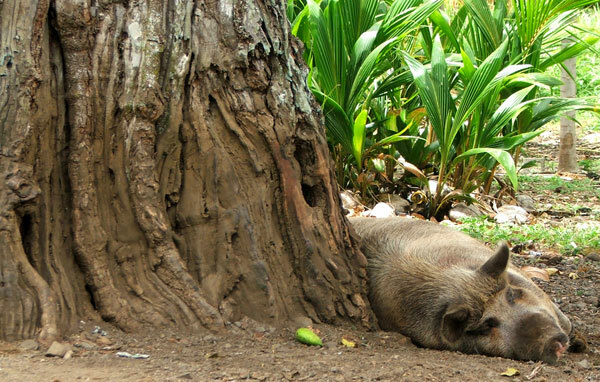 I was newly on holiday, and fascinated by the island animals I'd seen. Respectfully keeping my distance I photographed her. On Day Two I walked down the road again. My excuse was simple - I needed 'better light' to get a better pig photograph. Fair enough? This time I noticed more details - my pig was a sow, with a ring in her snout. But she was snoozing in exactly the same position. 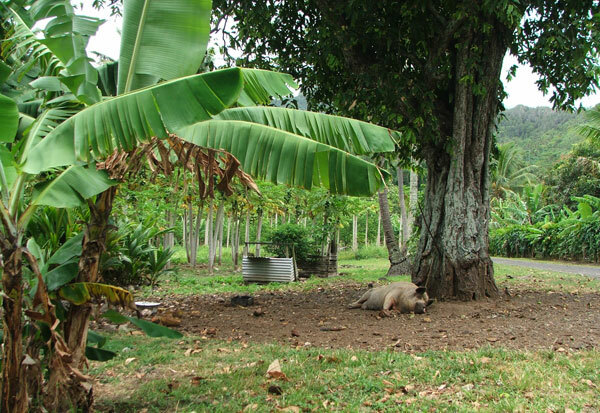 My goodness - island life moves slowly, even for a pig. 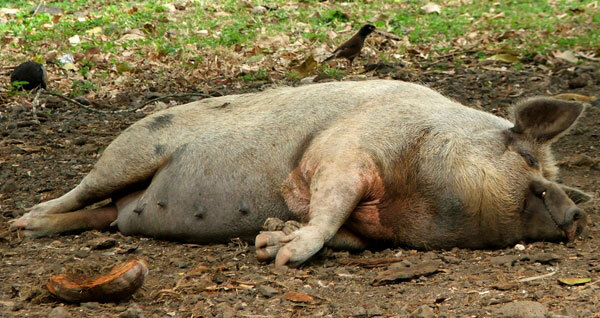 The next morning I walked down the Back Road to take even more photographs of Mrs Pig. She was such a difficult subject, being the same colour as the dirt and the tree trunk. I needed to get closer. But was she impressed? Not a sausage. She didn't even notice me. Her angle of rest had changed by about twenty degrees, and this time she actually did a body move - a languid stretch of the back trotters and a flick of the front. Then her Mynah bird-friend jumped back on top, and the status quo snooze recommenced. Mrs Pig, you deserve a slow, lilting poetic ballad, to celebrate your attitude to the passing of island time. But not composed by me, I fear. Off I went again to do a morning check on Mrs Pig. My goodness! In tune with the heavenly orb (that is, the sun), she'd rotated around her tree into a completely different quadrant. Ha! She was duly re-snapped and giggled at. Brainy pig! On the remaining days the driver of our island rental car had his instructions. On each journey - to a beach, into town, or anywhere on the island - we'd drive past the pig. I'd casually lean out of the car window to take more photographs, just in case anything had changed. It's three weeks later, and Daughter of Moosey writes: Mrs Pig has just had (i.e. 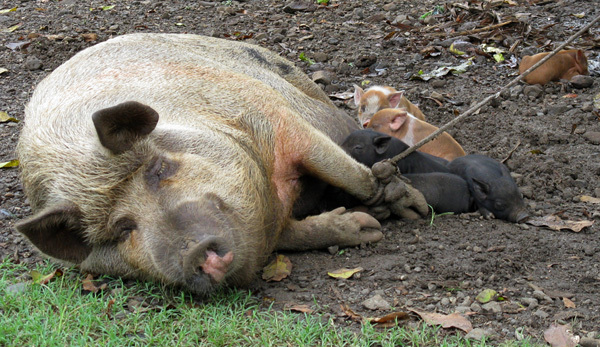 literally just had) about 7-8 piglets. I was walking past yesterday and right then and there out pops number 3 of approx. 8.